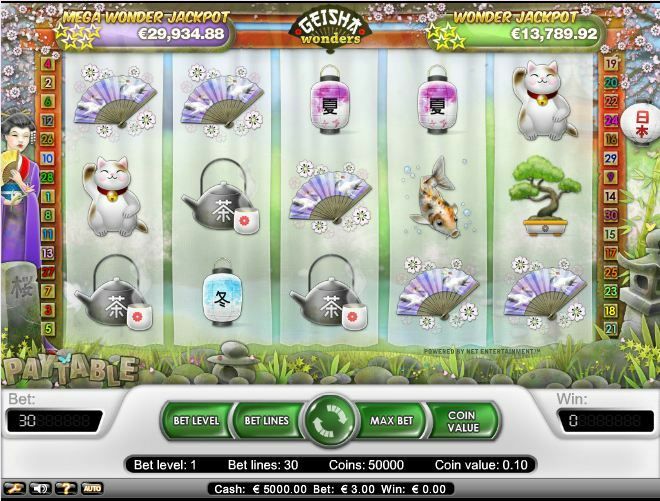 Come visit the world of the Geisha in Geisha Wonders, a beautiful video slot with 5 reels and 30 pay lines that is available at Mr. Green Casino, a casino powered by Net Entertainment. Here, you will find the Geisha and all the wonderful things that belong to her world, like different coloured Japanese lanterns, vases, Bonsai trees, tea sets and Japanese fans. It is a pleasure to listen to the lovely Japanese tunes, every time you make a win. Two Geisha Scatters will double your bet. When at least 3 Geisha's show up anywhere in the game, you will receive 10 free spins and you bet will be quadrupled. 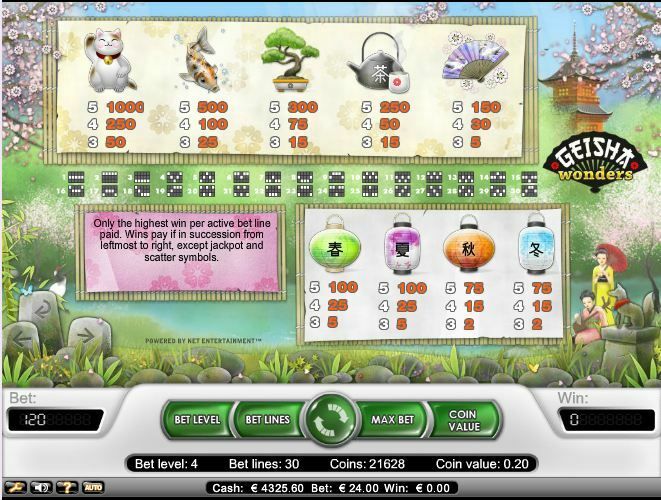 4 of those Scatter symbols will give you 20 free spins and your bet will be multiplied by 50. A dream comes true when 5 Geisha's honor you with a visit, because you will then get 30 free spins and your total bet will be multiplied by 400! All winnings are doubled during free play, and the free spin feature can be re-triggered as well. Yes, Geisha Wonders can be quite generous! 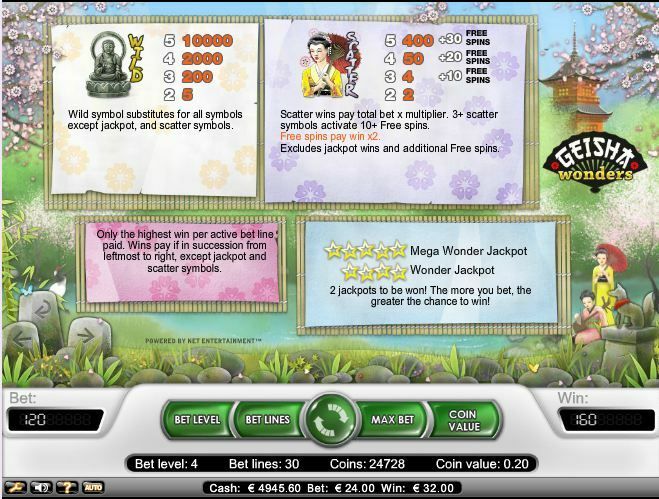 You can even win 2 jackpots - the Wonder Jackpot, which is almost € 4,000 and the Mega Wonder Jackpot, which stands at a whopping € 170,000 today! The Japanese Buddha is the Wild Symbol in this game. It substitutes all symbols, except the Geisha scatter symbol and the jackpots. And if you hit 5 Japanese Buddha's, you will win 10,000 times your line bet. The smallest bet you can make is € 0.30, and you can increase your total bet up to € 0.60, € 1.50, € 3.00, € 6.00 or € 15.00 when playing at the first bet level. There are 4 bet levels and 5 coin values to choose from - and the maximum bet you can place at this video slot is € 60.00 per spin. All lines pay from left to right. Also, for your convenience, you can use the auto play function. Play it now at Mr. Green Casino!